My first book, Get Scrappy, presented a system for smarter digital marketing for businesses big and small. As someone who’s built a career on being “brand driven,” it wasn’t too terribly shocking that the first step in this system was focused on branding. What was shocking was the first draft of this chapter. 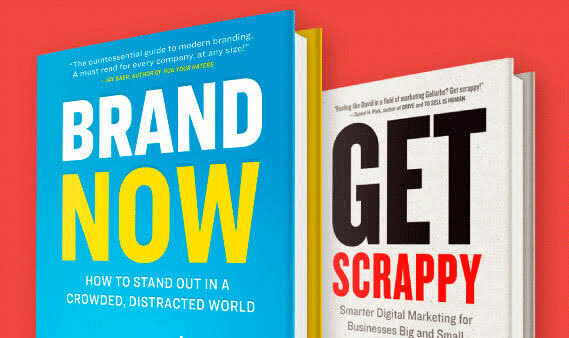 While most of the other chapters in Get Scrappy were a brisk 3,000 words, the branding chapter ballooned up to 7,000. That was when I first realized that my thoughts on branding might be a book of their own. Thankfully, my publisher allowed me to write it. With the rise of digital media, you’d think it would be easier than ever to be heard. Yet, most fail to cut through the clutter. 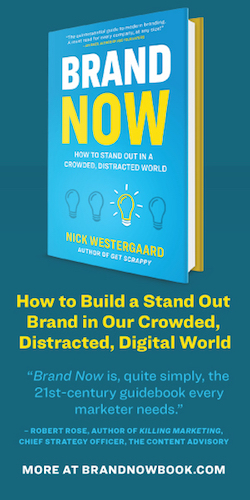 With Brand Now, I uncover the new rules of branding in our complex and chaotic world. I call them the seven Brand Now Dynamics. Meaning — To win over customers, your brand needs purpose. Who are you? What do you stand for? Answer these questions and create meaning around your brand. Structure — Use your unique brand promise to amplify the touchpoints that matter most, both online and off. Story — Our brains are hardwired for stories. 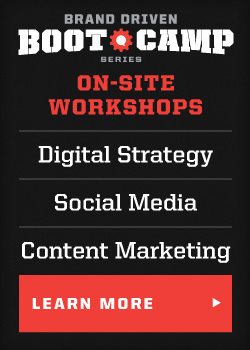 Learn to tell your brand’s core story, with a distinct, compelling brand voice. Content — Transform your story into content that’s engaging and shareable. Community — Beyond customers, broaden your fan base to include employees, vendors, strategic partners, and more. Clarity — Today, simple, transparent brands are more visible. Improving your brand isn’t always an additive process. Experience — People are drawn to brands where meaning infuses the entire customer experience. Create a strong culture by branding both internally and externally. Drawing on case studies, academic research, my hundreds of interviews on the On Brand podcast, and the travels of my large and eccentric family, Brand Now was truly a labor of love. It’s full of stories and diverse examples that make it a useful resource for brands of any size, in any industry. 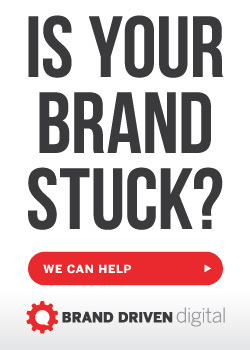 Part One focuses on the seven Brand Now Dynamics while Part Two is a Brand Now Toolbox with special sections for small business, B2B, personal, and political brands as well as resources for naming, crisis communication, and more. Brand Now is scheduled for release on May 3, 2018. If you’re wondering how you can help, simply pre-ordering the book is best as these early sales help the book stand out online with Amazon and other booksellers. As a way of thanking you for your pre-order, I have some special extras and other bonuses items just for you. 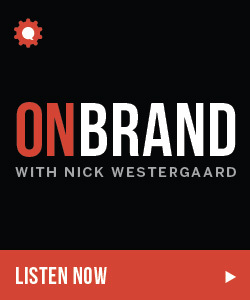 Brand Now Masterclass — A one-hour audio masterclass featuring some of Nick’s favorite branding thought leaders answering some of the biggest questions about brand building today — Patrick Hanlon (author of Primal Branding and The Social Code), Dorie Clark (author of Entrepreneurial You and Stand Out) Marty Neumeier (author of The Brand Gap and The Brand Flip), and Denise Lee Yohn (author of What Great Brands Do and Fusion). Brand Now Summary — An exclusive illustrated overview of the seven Brand Now Dynamics. Brand Now Workbook — Prompts and activities contained in an illustrated PDF workbook for easy access and sharing with your team as you work through Brand Now’s big ideas. Brand Now Story Shape Reference Table — A handy tool for referencing the brand story archetypes presented in Brand Now. If you buy 25 copies — you get the extras plus a free Brand Now webinar featuring yours truly. If you buy 50 copies — you get the digital extras, the webinar, and a free one-hour brand consulting session with me. We can put the big ideas in the book to work for your organization together. Simply order the quantity you want from Amazon, Barnes & Noble, or your favorite bookseller and forward your receipt to [email protected] to access your extras. And if you book me to speak prior to the book’s release, I’ll send you 50 free copies of the book. If you buy 500 copies, I’ll waive my fee and speak at your event for free (provided you cover travel). 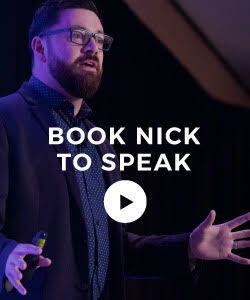 Contact me directly to learn more about speaking and books. Writing a book is a bit like being pregnant (I would imagine), planning a wedding, and a big product launch all rolled into one. I’ve been working on Brand Now for years — really since I set that branding chapter aside while writing my first book. 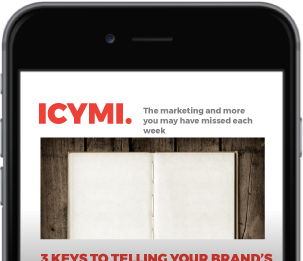 I am so excited for you to read this and to put the ideas to work for your brand. Let’s get started. Let’s brand now.